Some people are willing to forgo a certain level of cleanliness when “getting back to nature,” either out of choice or necessity. 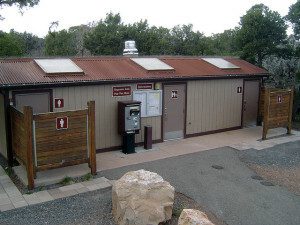 The shower facilities provided at campgrounds aren’t always cleanest, most inviting places in the world, which is a fact that most people who have done a lot of camping in a tent or a pop up is painfully familiar with. Sure some campground shower and toilet facilities are great, but they can’t all live up to the same high standards, and sometimes you’ll find yourself rolling into a campground that doesn’t have any at all. With that in mind, let’s take a look at some of the camping shower options that are available for pop up campers. Wet Bathrooms: Yay or Nay? Some campground shower facilities are great, but they can’t all live up to such high standards. Tent campers don’t have this option, so if you’re moving up from a tent to a pop up camper, the concept of a “wet bathroom” might be new to you. Essentially, a wet bathroom is the frankenstein-ish combination of a lavatory and a shower stall. It’s not as gross as it might sound at first blush, though. The toilet is built into the shower stall, but with the lid closed, it just serves as a seat (or an annoying obstacle, depending on your point of view) when the bathroom is being used as a shower. This type of camping shower is limited to pop up campers and especially small motorhomes and travel trailers, so a lot of campers will go their whole lives without seeing one. Since the bathroom is essentially a shower stall, you step up into the shower pan every time you want to use the toilet or brush your teeth. The walls are all water-proof, and the bathroom may be separated from the rest of the rig by a door or a privacy/shower curtain. Although wet bathrooms do present a viable camping shower option, they definitely aren’t for everyone. The overall lack of interior space in even the biggest pop up campers means that you don’t have a tremendous amount of privacy when showering in a wet bathroom (or when using it for its other intended function), and it eats up a lot of real estate even when it’s not in use. That’s why the wet bathroom is typically an option rather than a standard feature. A “wet bath” takes up valuable real estate, but it makes showering in the fall and winter a lot more pleasant. If you aren’t married to the idea of showering indoors, then you might want to opt for a smaller “dry” bathroom (or no toilet facilities at all) in order to conserve on space. Of course, then you’ll have to look at some of the other camping shower options. Outside showers are far more common in pop up campers than wet bathrooms, and they are available as optional equipment even on some of the smallest a-frames and tent trailers around. 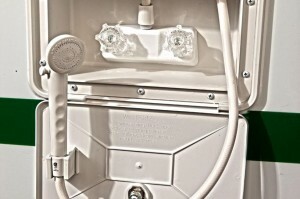 The basic concept of a built-in outdoor shower is pretty simple: one of the exterior compartments on the pop up camper will contain a faucet, shower head, and temperature controls. 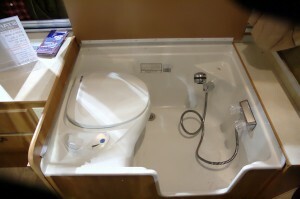 In some cases, the compartment will also contain a convenient water pump switch so that you don’t have to go inside to turn on your outdoor shower. Built-in outdoor showers are available as standard or optional equipment on most pop up campers. While an outdoor shower provides zero privacy, it can be a great camping shower alternative to dirty (or nonexistant) campground facilities. In the warmer months, you have the option to bathe in a swimsuit (if you don’t mind giving your neighbors a bit of a show), or setting up a portable shower curtain. This type of camping shower is a lot less comfortable in the winter months, but if you’re really in the mood for a hot shower, you can always jump right back into your warm camper after you’re done washing up. 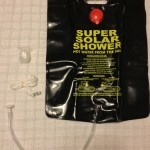 The last camping shower option is something that most tent campers are familiar with. These portable camp showers can be used anywhere, anytime, and all they really require is some water and something to hang from–any convenient tree branch will do, or you can set up some type of scaffolding under your awning for added privacy and protection from the elements. Like built-in outdoor showers, portable camping showers are a little light on the privacy unless you add a portable shower curtain. Unlike built-in outdoor showers, portable camp showers usually don’t involve hot water. If you want a hot (or at least lukewarm) shower out of one of these, you’re either going to have to heat the water over a fire (or run hot water from the tap in your camper). 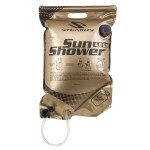 Solar camping showers are main exceptions to the “cold portable camping shower” rule. These showers typically consist of a bag that you fill with water during the day and then place in an area where it is exposed to the sun. The heat energy from the sun warms the water up, after which you can use it for a hot (depending on your definition of hot) shower later on. There are more complex solar showers, but the basic idea is still warming up the water with the power of the sun. Although they aren’t as common as solar showers, a propane shower can provide a much more satisfactory experience. These portable camp showers typically consist of a burner, a water tank, and a shower head, but there are a few different configurations out there. While they are significantly more expensive than solar showers, they do come with a few perks (other than being much hotter than solar showers.) Some of these portable camping showers use burners that can double as cooking burners, and others can be repurposed to provide hot water for cleaning your dishes if your camper doesn’t have a water heater. 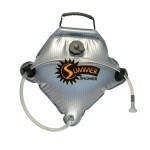 Ultimately, the best camping shower for your own needs will depend on your situation. If you don’t mind giving up some interior space in your pop up camper in exchange for privacy and convenience, then a wet bath could actually be a great investment. On the other hand, a built-in or portable camping shower will do the trick in a lot of situations without eating up a lot of valuable real estate inside your pop up. Of course, you can always just go “au naturale” (or rely on other ad hoc shower substitutes, like a good smoke bath) until you get back to civilization. We promise not to say anything–as long as you stay down wind. Previous story Where Do Hybrid Travel Trailers Fit?